When it comes to my guilty pleasures, one that calls loudly to me every time I walk through the mall is Cinnabon. Is there anyone that can resist the delicious aroma of freshly baked dough, sweet cinnamon and cream cheese frosting right out of the oven? Fortunately, even though my health (and waistline) manages to keep me away from gorging on cinnamon rolls every time I pass by, I can now enjoy the incredible flavor and smells of Cinnabon wafting through my own kitchen every single morning with the introduction of the new Cinnabon Classic Cinnamon Roll light roast flavored coffee. No, your eyes are not deceiving you! 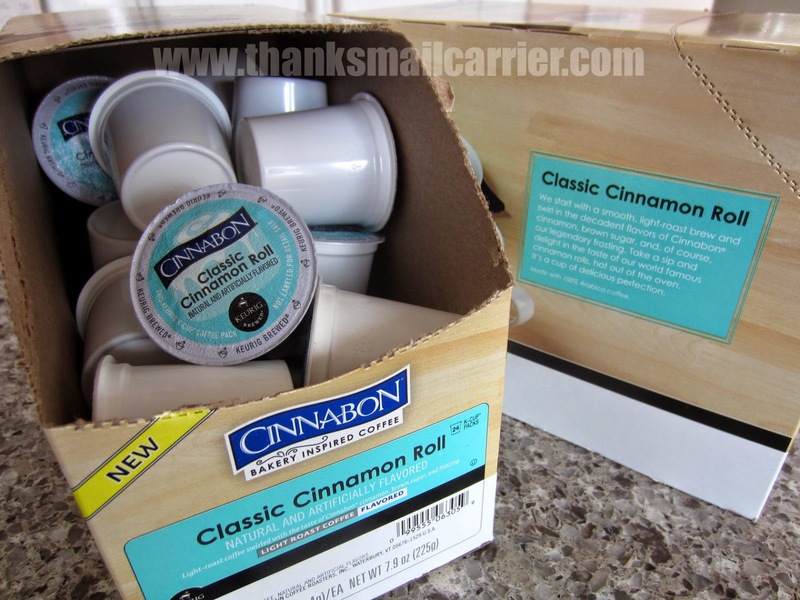 Cinnabon has partnered with the experts at Green Mountain Coffee to debut Cinnabon Classic Cinnamon Roll Keurig K-cup coffee and bring this collision of tastes into the ease and convenience of single serve coffee. Can you say YUM? While I typically have found that I'm not a big fan of flavored coffee, I was still highly intrigued by the concept of turning Cinnabon's amazing cinnamon buns into a hot, tasty drink, so as soon as these boxes arrived, I was tearing into them to give it a try. 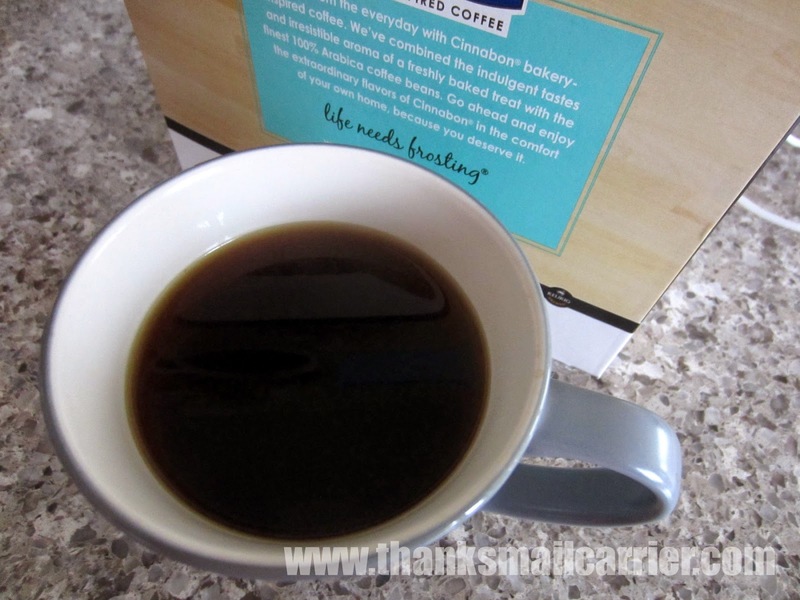 From the instant this coffee started brewing, the air was filled with the smell of a Cinnabon bakery and, in less than a minute, one perfectly brewed cup of Cinnamon Roll coffee was waiting in my mug. Mmm! From the first sip, I appreciated that the cinnamon/sugar/vanilla flavor is smooth and tasty but not overpowering enough that it was too sweet to be enjoyable. Although I had been worried that this coffee would be a little too sweet, it turned out just right! Instead, this light roast coffee has just the right amount of Cinnabon cinnamon, brown sugar and frosting swirled throughout that the result is irresistible and a bit indulgent! Not only has this become my new go-to morning brew, but I haven't had a single other brand or flavor K-cup since these arrived! If you're a fan of Cinnabon, you'll love that this unique new coffee is available in K-cups for everyday or special occasions. I recommend picking up a box to give it a try today! But don't spend more than you have to — head over to Cross Country Cafe! Their low prices ensure that you can receive a 24-count box of Cinnabon Classic Cinnamon Roll Keurig K-cup coffee for only $13.75 (with even more savings if you order a larger case). What do you think about being able to enjoy the flavors of Cinnabon in a cup of coffee? As a Cross Country Cafe Ambassador, I have been provided with products in exchange for my continued work with their company and affiliate links are included in the above post. The opinions shared are my own and honest and if you really need to see more, click here to see how I roll. The scent of Cinnabon has its own unique smell. The taste of Cinnabon is out of this world. I love that it now comes as a Keurig flavor. I think being able to enjoy flavors like cinnamon in a cup of coffee is wonderful. I like chocolate flavored coffee, anything with mocha. Thank you for sharing this review. i think this would taste amazing and i would actually like it. i do not drink coffee that much but would make an exception for this. We have a Keurig mainly for my husband as I am not a coffee drinker but this cinnabon flavor has me interested!